Should I just chance it (Time and materials)! All our engineers have undertaken manufacturers training courses to ensure your photocopier, copier is maintained to the highest possible standard. As part of the Trading Standards "Buy with Confidence" scheme our engineers where CRB checked. Photocopiers like cars have two types of parts - Consumables and spare parts. The four colour developer units compile the full colour image on the transfer belt prior to being transferred to the paper. The belt will need to be replaced between 60,000 and 100,000 cycles, remember a photocopier cycles the components during start up and cleaning cycles. Spare parts are like a door handle on a car, they do not have a set time schedule after which they cease to work correctly, they tend to function for years before failing. Spare parts can range in price from a few pence to £400 for circuit boards. Before you make the decision you need to understand that your photocopier will eventually need maintenance and its consumable parts replacing. Photocopier life expectancy at least 5 years. The customer who opted for maintenance agreement has been paying £30 per month and knows he's covered for the next 2.5 years as well, irrespective of what goes wrong. Photocopiers have traditionally been supplied with a maintenance agreement. The maintenance agreement is a way of budgeting for maintenance, labour and the replacement of consumables when required at fixed cost per copy. The higher the number of copies you produce the lower the cost per copy becomes. These prices increase by 8% per annum as the machine gets older. Once a quarter we will take a meter reading and charge for any excess copies at the same cost per copy rates. For this payment we provide all labour required to maintain the machine, all consumable spare parts (excluding toner see below) and all spare parts for 5 years. After 5 years we will continue to maintain the equipment as long as you pay the charges. Your service calls take priority overtime and material calls. We have maintained machines for over 9 years on maintenance agreements. Toner is the most expensive consumable within the copier, but it is also the most unpredictable. All cost per copy agreements are based 5% resolution, if your printed output always contains 5% resolution you will get 10,000 copies from a tube of OKI ES8460 toner. The black toner costs £27 divided by 10,000 copies equals 0.27p per page, unfortunately modern copiers produce such good output people can print anything from 3% - 70% coverage. We therefore decided to charge for toner separately, if you choose to cover a document in toner you will have to replace it sooner, everyone knows where they stand. Beware toner inclusive maintenance agreements! Caution - We are seeing and hearing of a lot of instances of people purchasing equipment on what appears to be very cheap maintenance agreements which include toner, the supplier states that toners will produce 40,000 images. After several months the clients receive a letter informing them that they are only achieving 10,000 copies per toner, the maintainers then increases the service charges by up to 400%, these are legally binding agreements and the client has no choice but pay the increased charges for the remaining four and half year duration of the agreement. The fraudulent bit occurs when they over estimate the life of the toner deliberately creating a figure you will never achieve on purpose so they can increase the cost per copy. Description - Photocopier Copier servicing in Crawley, West Sussex and Surrey 01293 537827, we maintain, repair, service, fix, Black and White, mono, A4 & A3 Colour, color, Towns in which we, repair photocopier, copiers Arundel, Billingshurst, Burgess Hill, Caterham, Crawley, Charlwood, Copthorne, Cowfold, Cranleigh, Dorking, East Grinstead, Edenbridge, Ewell, Epsom, Forest Row, Godstone, Haywards Heath, Horley, Horsham, Leatherhead, Lingfield, Oxted, Partridge Green, Redhill, Reigate. Meta Tags - photocopier, copier, repair, service, servicing, maintenance, fix, mend repairs in Arundel, Billingshurst, Brighton, Burgess Hill, Caterham, Cheam, Crawley, Charlwood, Copthorne, Cowfold, Cranleigh, Dorking, East Grinstead, Edenbridge, Ewell, Epsom, Forest Row, Godstone, Haywards Heath, Horley, Horsham, Hove, Leatherhead, Lingfield, Oxted, Partridge Green, Purley, Redhill, Reigate, Sutton, Worthing We repair fix the following manufacturers photocopiers, copiers Brother, Canon , Gestetner, Hewlett-Packard, Infotec, Konica Minolta, Kyocera, Kyocera Mita, Lanier, Minolta, Mita, Muratec, Nashua, Nashuatec, Oce, OKI, Olivetti, Panasonic, Rex-Rotary, Ricoh, Samsung, Sharp, Toshiba, Xerox. Equipment will be replaced at around 60,000 prints to avoid large bills. Customer who choose to chance it! has paid £20 more, his bills came in 3 chunks getting progressively larger and he's now worried how much the next bill will be and should he change the machine. 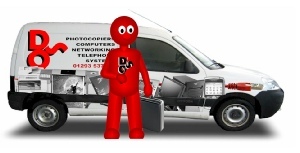 Digital Office Solutions have been supplying and maintaining photocopiers, copiers, printers and multi-function equipment in Crawley for 20 years. We can install and setup network multi-function machines for printing and network scanning. Digital Office Solutions are a Trading Standards "Approved Photocopier, Copier maintainer"
We are based on the outskirts of Crawley, if you are looking to keep costs to a minimum you can bring your equipment to our photocopier, copier repair workshops that are fully equipped to undertake any photocopier, copier, multi-function , printer, repair. We offer photocopier copier support agreements or time and materials support. A colour photocopier has 4 drum units, the laser writes a static latent image on to the drum surface, this then attracts the toner prior to transferring the image to the transfer belt. The photocopier fixes the toner powder to the paper by heating it to 200'C and crushing it on to the paper. The fuser is just like a mangle except the top roller is hollow and a heater element heats it to the desired temperature. Toner being a plastic resin wants to stick to the fuser rollers, so the roller is coated with Teflon, the Teflon eventually wears out and toner sticks to the heat roller which is then off set down the page. The rubber feed tyres that feed the paper out of the paper cassettes become hard and fail to pick up paper eventually.